Meet Poppy. A lovely friendly girl who was living on the streets but being fed by some kind people. 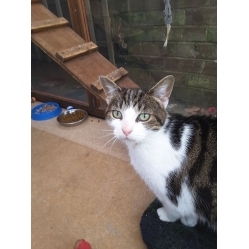 Poppy is spayed, id chipped, de flead, wormed and negative fiv/felv. She is due for her 2nd vaccination in 2 weeks time. If you live in a safe area and would like to meet this gorgeous girl, then please get in touch . She would prefer to be the only cat.